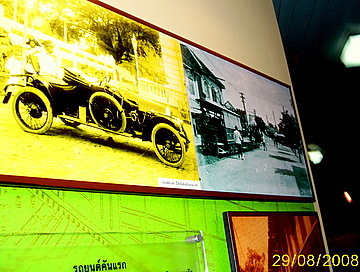 Bangrak Museum records the history of early Bangkok with quaint and charming memories. The museum is colocated with the Bangkok Folk Museum in Soi Charoen Krung 43 and preserves old photos of early Bangkok in the Bangrak district. There are a couple of reasons as to how the district got its name. One version is that the name came from the huge Rak tree trunk sunken in one of the canals in the area. Another is that the name came from the Thai word, “raksa” or to care for. This is because of the large number of hospitals in the area. The roads and canals in the area and the people who contributed to the construction. Over two centuries, Bangkok grew from a fortified city to a commercial port and onto an urban industrialized metropolis. The Portuguese were the first Europeans to arrive in Thailand in the Ayutthaya days. Their embassy is the oldest in Bangkok, located in Charoen Krung, the oldest road. Bangkok grew quickly as a trading port with traders from Portugal, Holland, Britain, India and China. Most of the foreign communities were in Bangrak. As Bangkok grew, it became a cultural melting pot for Thais, Chinese, Mon, Lao, Indians, Europeans and Americans. When the Bowring Treaty was signed in 1855 in the reign of King Rama IV, trade in Bangkok opened up. Foreigners were granted the right to trade directly, hitherto a royal monopoly. Trading companies were setup together banks, warehouses and factories. With the foreign traders came the missionaries. In the prevailing religious tolerance, churches, temples, mosques, schools, convents and hospitals were built with royal land grants. This is evident from the number of churches, temples, hospitals and schools in the area. Retail shops grew to support the trading activities. The first printing press in Thai started in Bangrak. As trade grew, so did the need for transportation. 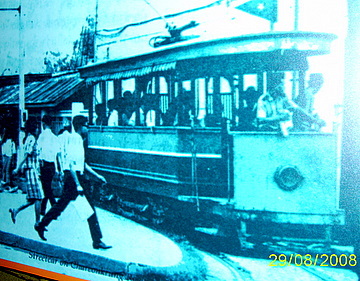 Roads and canals expanded rapidly, with street cars and the first railway, the Bangkok - Paknam line. 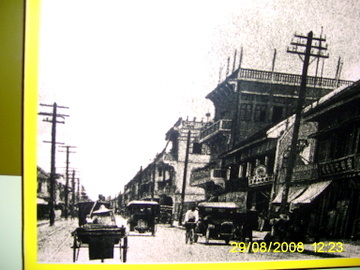 As the early roads were in this area, the first automobile in Bangkok appeared in Bangrak. Canals played a vital role in bringing rice and other produce from the provinces to Bangkok. 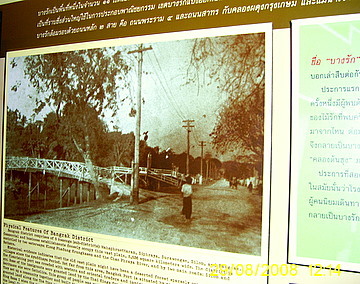 The Bangrak Museum has an interesting record of the origins of these early roads and canals. Charoen Krung Road the first road built in 1861 became the commercial hub of Bangkok with foreign trading houses, banks and hotels. One of the early hotels was the Oriental Hotel built in 1876. 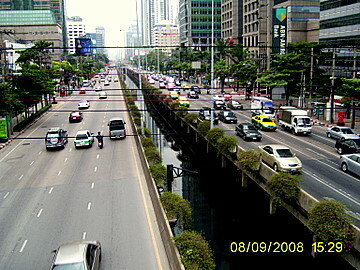 Silom, Sathon, Si Phraya and Surawongse were four parallel roads extending eastwards from the Chao Phraya River. These roads were built by excavating a canal in the middle to allow for canal and land movement. Silom or windmill was named after the windmills in the area used to draw water from the canals to water the vast orchards. 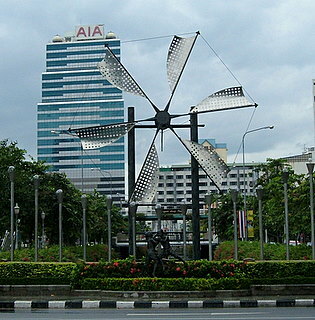 Today, the only windmill left is the one at the junction of Silom Road and Narathiwat Road. If you have visited Bangkok, you would probably have passed along this road. But I’m sure it didn’t look like this during your visit. It was more likely like this during your visit. Some of the roads were named after royal titles awarded to people who contributed to the construction. These titles were often adopted as the family names of the holders. 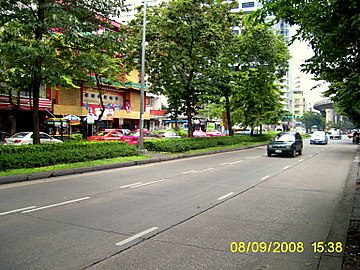 Si Phraya Road was named after the Four Phrayas or noblemen, a name given by King Rama V.
In 1893 during the reign of King Rama V, a Chinese immigrant, Chao Sua Yom won a royal concession to dig a canal linking Wat Yannawa near the Chao Phraya River to the Hua Lampong canal (Rama IV Road today). The law then granted concession-holders rights to the land 1,600m wide on both banks of the canal. Two roads were built flanking the canal. For his efforts, Chao Sua Yom was awarded the title, Luang Sathon Rachayutt and the road was named Sathon Road in his honor. Here’s an old photograph of Sathon Road with its canal in the early 20th century preserved in the Bangrak Museum. The land in Sathon Road was parcelled off and sold to wealthy Thais and foreign residents. Today it’s the filled with foreign embassies, banks, condominiums and commercial blocks. Chao Phraya Surawongse Wattanasak gave his name to Surawongse Road and Decho Road got its name from Phraya Siharaj Decho. Another interesting aspect recorded in the Bangrak Museum is the origins of the well-known Patpong area, named after Luang Patpong Panich, a title given to a Chinese immigrant who married into a rich local family. The family estate is now the Patpong entertainment area. However, most visitors to the place wouldn’t be aware of the regal origins of the name. Saladaeng or red roof pavilion was named after the train station built by the Danish company that ran the Bangkok - Paknam line. The area was royal land and used to be rice fields where the annual Royal Ploughing Ceremonies were held. 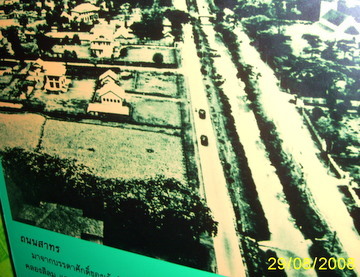 In 1925, King Rama VI donated a large tract of Saladaeng for a public park, Lumpini Park. 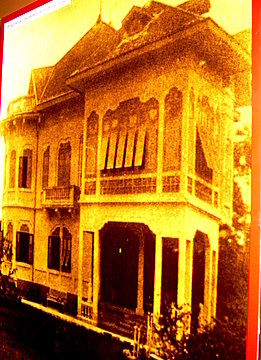 The residence of Chao Phraya Yommarat, a minister in the reign of King Rama V, was also called Saladaeng. 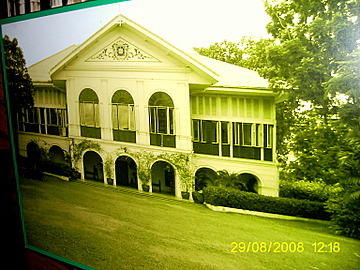 The Dusit Thani Hotel has taken the place of this old residence today. Another old home in the area was located at the junction of Silom Road and Soi Pipat. That old home is gone. Today the head office of the Bangkok Bank stands in its place. In the early 1960s, the canals along Silom, Sathon, Surawongse and Si Phraya were covered up for road expansion. Today the roads and institutions in Bangrak are still there, a legacy of the early immigrants and communities in Bangkok. But all that's left of the canals, orchards and windmills in Bangrak are the old photos in the Bangrak Museum except for the last windmill in Silom Road. While you're there, visit the Bangkok Folk Museum as well. The two museum are in the same location. If you're coming by skytrain, get off at the S6 Taksin Bridge station and walk along Charoen Krung Road. Soi Charoen Krung 43 is on the right after the General Post Office. It’s a little over a km. If you don’t wish to walk, take a boat from the Sathorn Pier below the Taksin Bridge station to the N3 Si Phraya Pier. Once you get off the boat, walk out along Soi Charoen Krung 30 past the Portuguese Embassy till you get to Charoen Krung Road, then turn right. Once you are in Soi Charon Krung 43, keep walking till you pass under the flyover. The Bangrak Museum is just a little further on the right. The museum is open every day between 10:00 am – 04:00 pm except Mondays and Tuesdays. The main gate is usually closed. Ring on the door bell and a staff member will let you in. While you are there, visit the Bangkok Folk Museum which is located in the same premises. No admission fee is charged but visitors could leave a donation for the maintenance of the museum. All the old photographs on this page are with the courtesy of the Bangrak Museum.